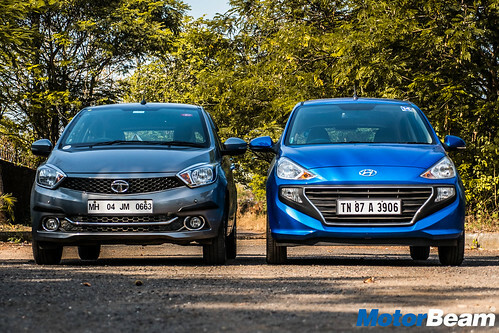 Two decades back the Indian auto industry saw game-changers in the form of the Tata Indica and the Hyundai Santro. 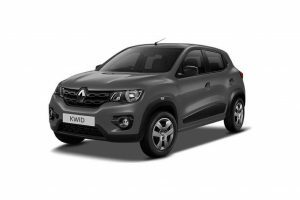 Small, compact, easy to drive, economical and relatively affordable, these cars appealed to the masses. Fast forward 2018, the battle is not so easy. 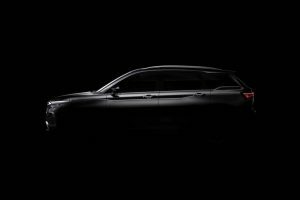 With an ever-growing number of choices and changing consumer preferences, both Tata and Hyundai have to go the extra length to create the magic. The question is which of these cars go the farthest in replicating all that we loved about their predecessors? Exteriors - The Santro looks smart and a bit European in its appearance. It does not retain the classic tall-boy proportions of the older car but it looks up to date with the times. 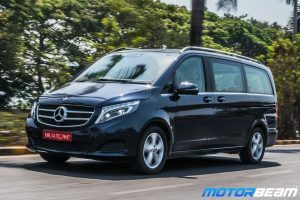 It does have some quirky elements in its design, such as the grille which could have done with better styling. 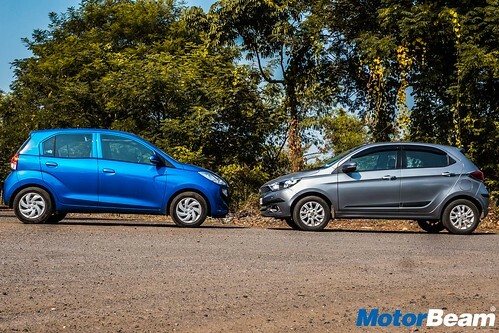 In comparison, the Tiago looks beautiful and that is despite it being much older than the Santro. The design is progressive and there is little doubt that it will age well. At times the Tiago's brilliantly executed design makes it look much more expensive than what it actually is. Interiors - The interior is where it gets significantly more difficult to pick a winner. The Tiago's cabin is nothing short of an exceptional effort by Tata. It feels quite upmarket. The fit and finish is not outstanding but is on par with other cars in the segment. The superb textures on the dashboard and the seats and that excellent sounding Harman audio system make this a great place while grinding through the city traffic. 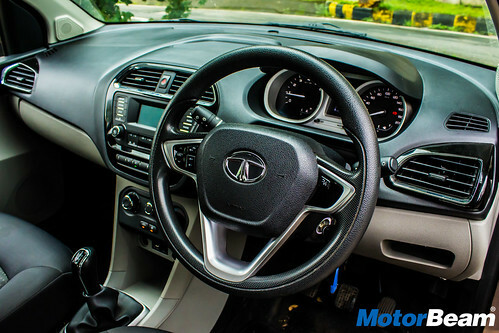 The Santro's interiors are no less feat either. 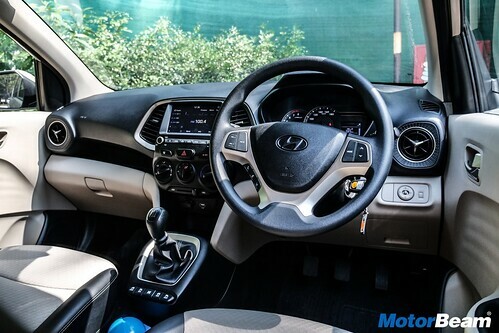 Hyundai interiors never fail to gain accolades and the Santro is no exception. 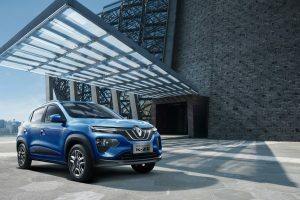 The quality of materials, fit and finish, features on offer and the general ambience is spot on and almost knocks the door of a higher segment car. The Santro gets many segment firsts including a touchscreen infotainment system with Apple CarPlay and Android Auto. In a cabin so well appointed, it is a bit of a downer though when you come across the visible cost-cutting. 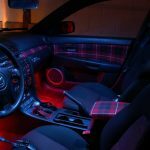 For instance, the power window switches are placed near the gear lever and they are not backlit making the operation quite difficult especially at night. The Hyundai logo on the steering wheel is not chrome and the aircon controls feel old and plasticky. But these are minor shortcomings in an interior that otherwise feels like a proper Hyundai. The Santro even comes with a rear AC vent which none of its rivals offers. The Tiago recently got a new XZ+ variant which comes with automatic climate control. In terms of space, both the cars are quite spacious and offer generous amounts of leg room. Head room in the Tiago is good but it is slightly better in the Santro due to its height. 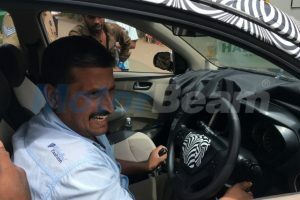 I personally found the seats of the Tiago to be better shaped than the Santro's seats. 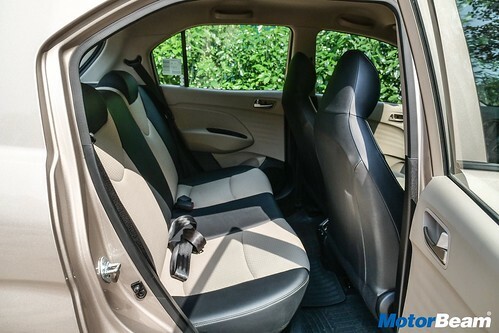 The front seats of the Santro don't get adjustable headrests which is a pity because the Tiago gets them. 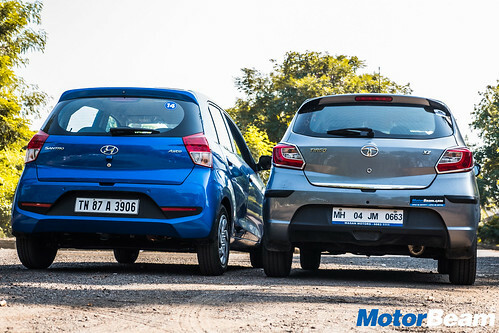 In terms of storage spaces and cubby holes, both cars are more or less similar but the boot capacity on the Santro (235-litres) is slightly lesser than the Tiago (242-litres). 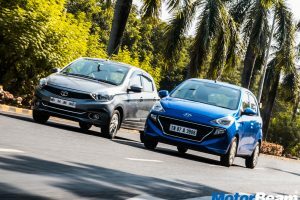 Performance - The new Hyundai Santro gets the same 1.1-litre Epsilon motor that powered the older car. 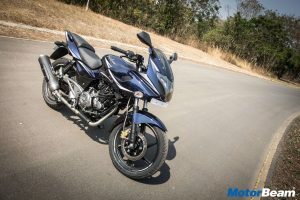 The engine produces 69 BHP and 99 Nm of peak torque - figures that don't make it look very impressive. Meanwhile, the Tata Tiago produces a class-leading 83 BHP and 114 Nm of peak torque from its 1.2-litre petrol motor. 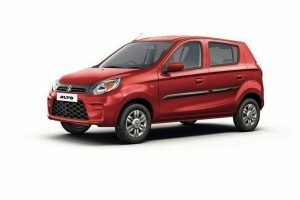 The figures are superior to those in the Santro but the trouble is not all of it is translated on the road. But start the Santro's engine and what you'll instantly notice is just how quiet it is. 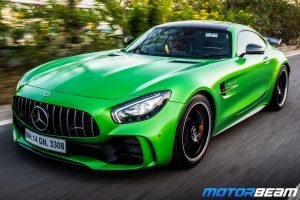 That is because it is the only car in its class to come equipped with a 4-cylinder engine. The 3-cylinder engine in the Tiago lacks the smoothness of the Santro and tends to sound quite vocal. 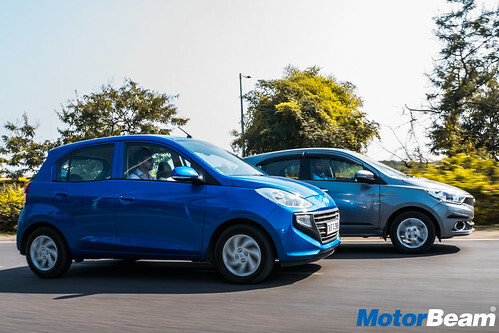 The Hyundai's performance is more than adequate in town and it is really in the midrange where the Santro shines. 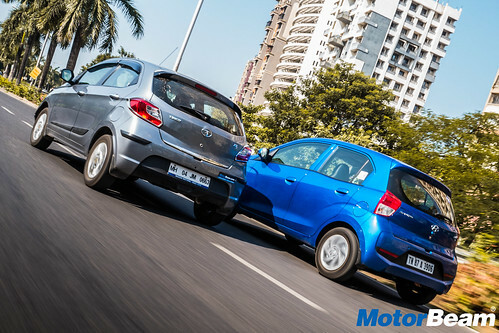 Overtakes come in quickly and the Santro is one of the quicker cars in the in-gear acceleration. It is only when you extend your right foot, do you notice a bit of a lag before the engine wakes up. 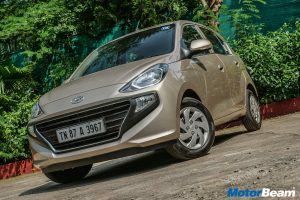 The Tiago isn't a lively performer and the performance is best described as adequate but no more. You have to work the engine a fair bit to get the most out of it. 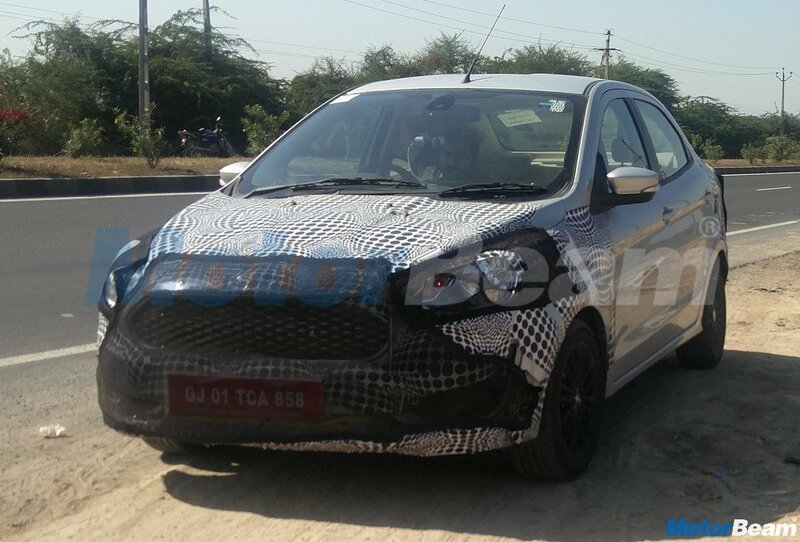 The power buildup is not as linear as in the Santro and the Tiago feels positively jerky in stop-start traffic. 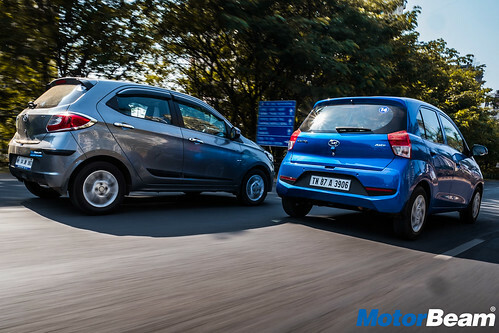 Likewise, the 5-speed manual gearbox in the Santro doesn't like to be hushed. However, it is blessed with a light clutch and good gear throws. The gearbox of the Tiago is not the best either. The clutch is not very progressive and slotting into gears needs a bit of an effort. The Tiago is the only car here that gets driving modes. The City and Sport modes, albeit slightly, change the way the engine performs. One thing to be remembered that the Tiago is now offered with a turbocharged 1.2-litre petrol engine from the Nexon under the JTP badge. It is quite sporty and definitely lifts up the driving character of the Tiago. 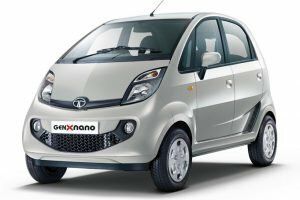 The Tata is the only car out of the two to offer a diesel engine which we feel is better than the petrol. Both the cars also get an option of an AMT gearbox. 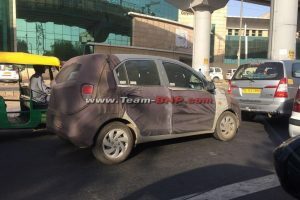 The in-house developed AMT in the Santro has smoother gearshifts and faster response compared to the AMT in the Tiago. However, unlike the Tiago, the Santro AMT is not offered in the top-spec variant and the lower variants miss out on a lot of features. Driving Dynamics - The Tiago shines in the ride and handling department. 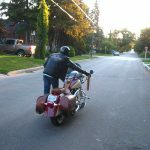 The steering has great heft meaning cornering is surefooted. 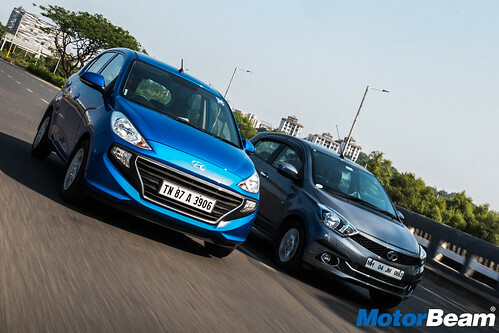 The body roll is well contained and it actually feels fun chucking the Tiago around corners. The well-shaped steering wheel only makes it better. 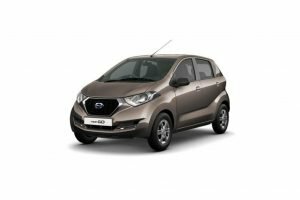 With its light steering, superb visibility, and small turning circle, the Santro is a breeze in city conditions. The high-speed stability is a sore point though and the Santro just can't give you a sense of confidence like the Tiago. The ride quality of the Tiago is superb and there is a big-car maturity to the way it copes with the roads. The suspension is soft and it isolates the passengers rather well. Owing to its higher kerb weight, the high-speed stability is commendable in the Tiago. It does not feel shaky like some hatchbacks do and cruising at high speeds will inspire confidence. It is a pity then that the engine fails to contribute to the excellent driving dynamics. 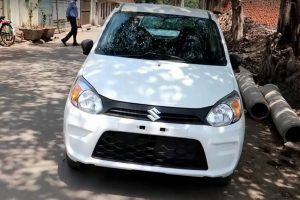 The ride quality on the Santro is also good and the suspension goes away doing its business in silence. 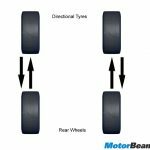 The tyres on the Santro don't offer sufficient grip and this can be evident when braking hard. Safety and After Sales Service - There has been increasing pressure on the safety of these segment-specific cars. Except for the base variant, all the variants above get an option of ABS and dual airbags (the top end has it standard) on the Tiago. 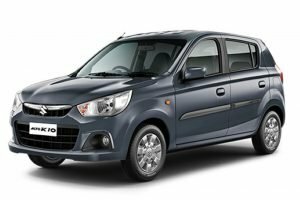 The Santro goes a little ahead in offering at least a driver side airbag and ABS as standard even on the base variant. It remains to be seen how these cars perform in real-world tests to reach a final conclusion. In terms of service, Hyundai is definitely better than Tata. 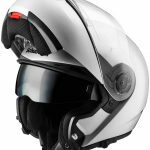 The brand is strongly associated with reliability. 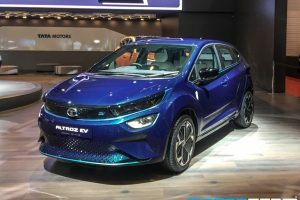 Tata has improved the quality and after sales of their products but it will be some time before they catch up to the standards set by Hyundai. Verdict - It is a very close fight between both the cars. 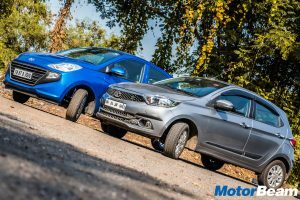 The Tiago scores well in terms of build quality and driving dynamics. It is a well rounded Tata but it is the engine that lets it down. 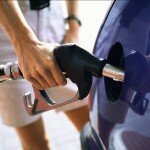 The petrol motor does not have the zing of the Santro's. The Santro has a few flaws too. The cost-cutting is visible and dynamics aren't the car's forte. 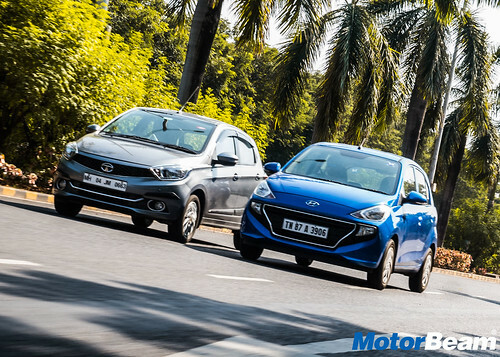 But the Santro's engine is really peppy and factor in the well-built interiors, ease of driving, good comfort and Hyundai reliability, the Santro has what it takes to be ahead of the game. 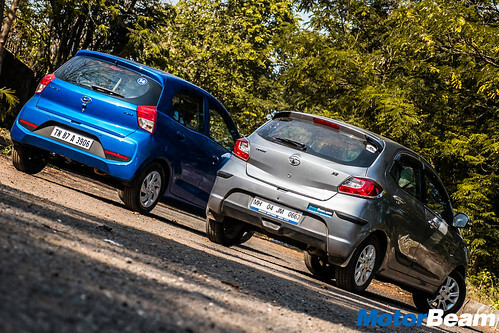 The new Santro takes off where the old one left and that is why it is our pick.